Breathe Freely is an initiative of BOHS and is sponsored and supported by RVT Group. Free-to-attend morning workshops are being hosted as part of the initiative. 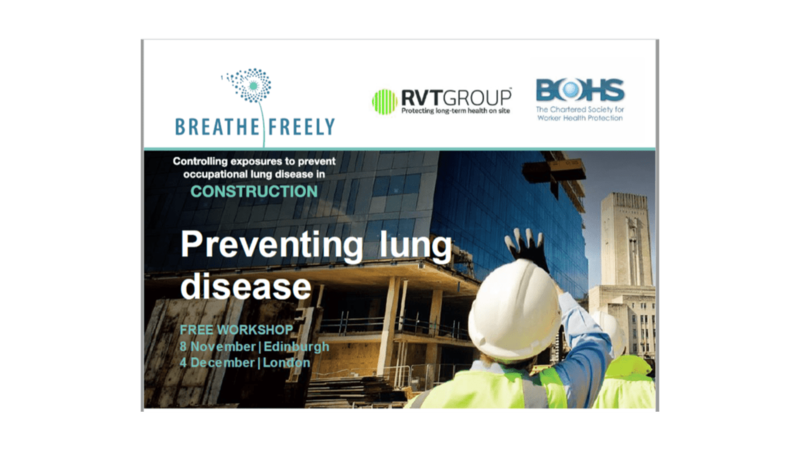 They focus on the prevention of lung disease in construction, which is the cause of an estimated 13,000 deaths per year in the UK. Taking place in London in December, speakers at the 2018 workshop include BOHS, HSE and industry experts talking about the challenges faced on site, upcoming developments, and what can be done to protect construction workers. Aimed at those responsible for the long-term health of construction site personnel, the workshops provide the ideal opportunity to access the knowledge and tools designed to protect the health and wellbeing of site workers and those nearby. According to the HSE, there are approximately 3,500 work-related cancer deaths in the construction industry every year – with asbestos and silica the major causes. Breathe Freely believes that if everyone understands what the hazards are and how they can be minimized, protecting site workers and the general public from construction site hazards is possible. "With 13,000 deaths a year as a result of exposure to dust and fumes, working together is vital to help drive these horrific numbers down. “The Breathe Freely events organised by the BOHS help to bring us all together to talk, share ideas, listen to industry experts and find out more about the resources available.